Through the doorway of the mezzanine is a study/hall with, desk and wifi internet access. Ahead is a a charming double bedroom with roof lights above the bed to gaze at the stars. It has a en-suite bathroom with glazed shower unit, bath, basin and toilet. Up a small flight of stairs from the hall there is a spacious master bedroom suite. Les Pins is a no smoking house and no pets are allowed. All linen is provided including bathroom towels and swimming towels. The house is cleaned on changeover days. If change of sheets and extra cleaning is required this can be arranged. Les Pins is an immaculate hosue and is ideal for two families wanting to have a comfortable holiday or even one family enjoying the luxury of this fabulous home. 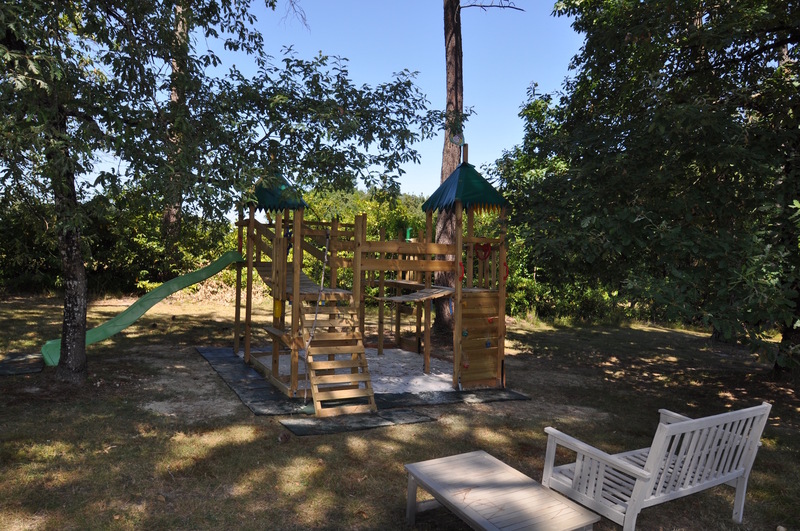 Les Pins could be where you enjoy your relaxing family holiday in the Aquitaine region. Les PINS is an immaculate villa renovated to a very high stand of comfort. 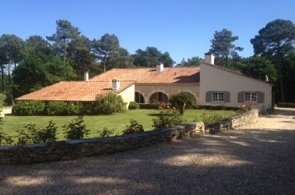 Les Pins is surrounded by vineyards and woodland. It is close to St Emilion and within a few minutes drive from all the local amenities. 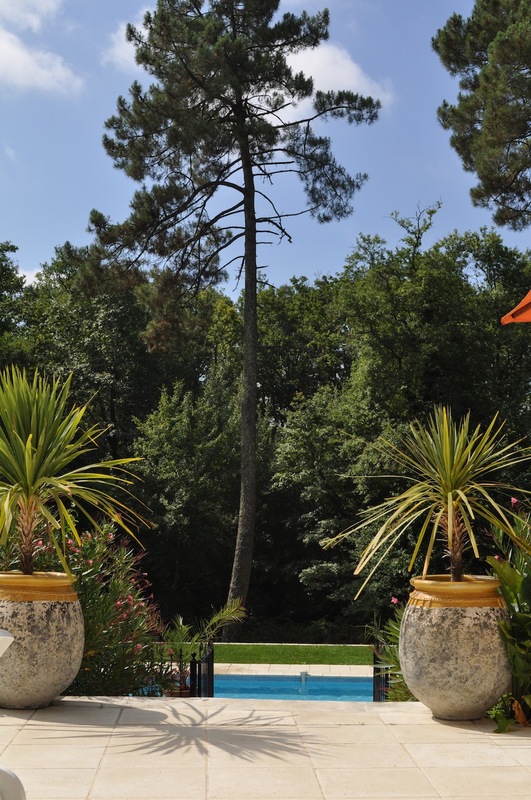 Les Pins sits due South on the edge of its own private wood surrounded by pine trees and oak trees with fields beyond. 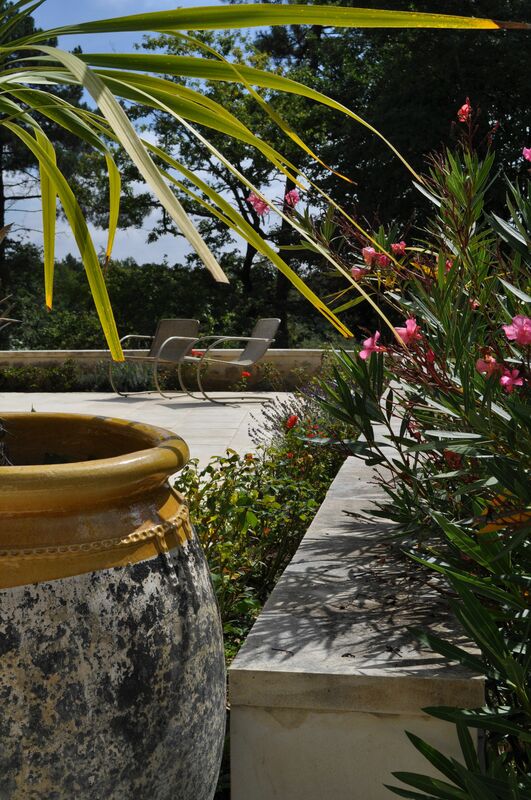 Les Pins is an ideal place to immerse yourselves in total privacy and enjoy the natural surroundings. This is truly a corner of tranquility and it could be where you enjoy your next relaxing holiday. You enter Les Pins through security gates and into the circular drive with the central lawn ahead edged with an avenue of roses and a back drop of hydrangeas. To the right of the entrance due West is the start of the wood which embraces two sides of the villa. To the left is a lawn with a great climbing frame which makes super entertainment for the kids. As you drive ahead to the gravel parking there is a paved parking area an undercover bbq with a chimney breast along with an outdoor fridge and ‘table tennis’. 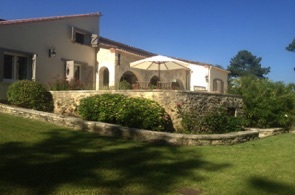 Opposite is an arched verandah with three French doors leading into the villa. To the east of the villa lies a beautiful lawn with an orchard and then fields beyond. On the South side of Les Pins from the double doors in the living room you are on the wonderful wide large terrace with another verandah giving a shaded outdoor lounge. 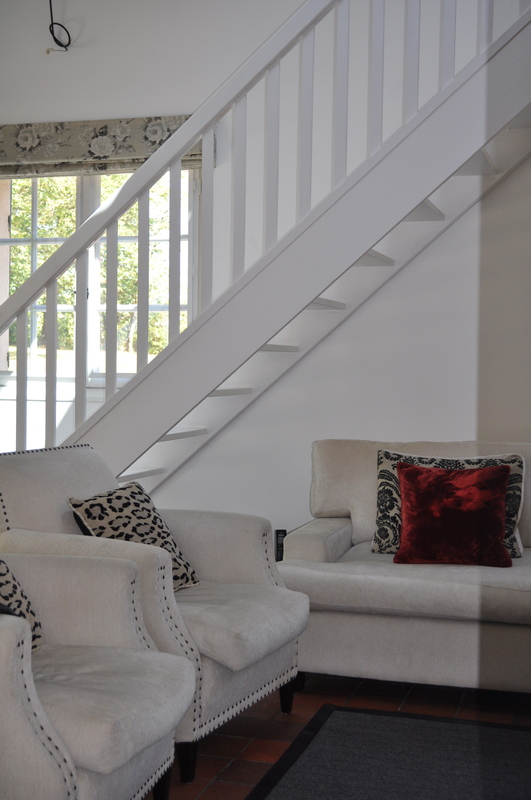 The terrace frames two sides of the house maximising the sun. Under the umbrella is the outdoor table and chairs along with sun loungers. The stunning swimming pool is down within a gated arena facing onto the woods The pool is 5m /12m with roman steps and is heated for your comfort and those cooler climates. There is an outdoor shower to the side of the pool near the locked pool house and eight very comfortable sun loungers for sunbathing around the pool. When entering this immaculate property through either of the three French doors from the parking area you are welcomed by a stunning modern open plan kitchen and dining room. The kitchen is well equipped with a dishwasher, large oven, microwave, with a 4 ring electric hob and a double sink. Off the kitchen is a super utility room equipped with washing machine, tumble dryer, Belfast sink, ironing board and all the necessary cupboards and shelves. As well as a large family size fridge freezer with a built in ice-maker. There is a second fridge aswell as a seperate wine cooler. Walking through the arches from the kitchen and dining room you are greeted by the elegant sitting room with a fabulous fireplace and one large corner sofa as well as a three seater sofa. There is a TV, DVD player and free to view box allowing you to access the standard UK channels. There is also wifi Internet access. Through the door off the dining room you have some of the downstairs sleeping quarters which are two good size double bedrooms. 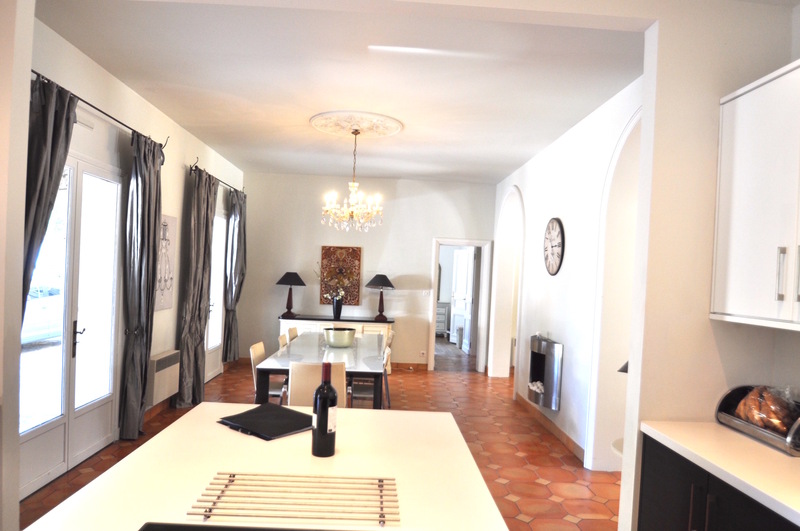 Both bedrooms have French doors onto the surrounding terraces. The master bedroom has two free standing wardrobes a chest of drawers and a large double bed, 160 / 200 cm. It has it’s own bathroom with a bath, double vanity unit, WC and a large glazed shower enclosure. Off the kitchen and laundry room there is a a lovely bright sitting room or snug room with stairs leading to a mezzanine and to the first floor. This room is equipped with a flat screen TV, DVD, Apple TV, i phone/ i-pad video connection. 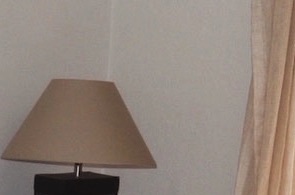 The whole house has wifi along with Internet boosters in the rooms to emphasise the connection. There is an additional WC around the corner of the hallway which serves the play / study area. Through the door you enter a light and spacious en-suite bathroom with a shower enclosure, free standing bath, washbasin, WC and dressing table. Through a further door there is a lovely light and airy bedroom within the eaves with wardrobes either side and a fabulous large 2m/2m double bed. There is also a day bed and a cotbed available making a family unit. 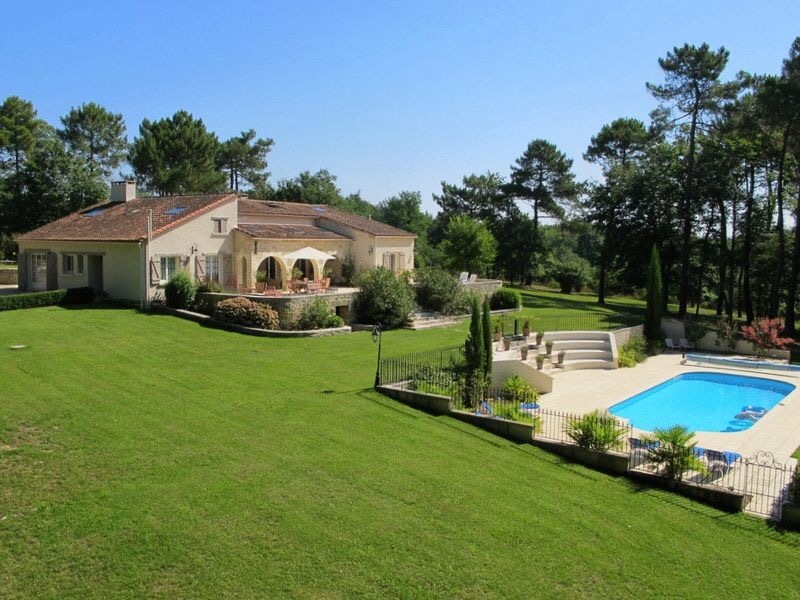 Click on the above link to retun back to our home page where you will find our great selection of luxurious villas that are being offered for holiday rentals in the Aquitaine region. In our Alternative pages we are pleased to offer a holiday cottage close to the Arcachon Basin and Atlantic beaches. We also have a farmhouse with private pool attached to the owners home, a great Pigeon Tower with a shared pool and a cottage set in owners grounds with private gardens and pools.